The following notice appeared in the Brooklyn Daily Eagle, 16 Dec. 1936, p. 15, "Charles Hoelzer Sr., owner of the ornamental ironworks firm at 380 Harmon St., bearing his name, died yesterday after a short illness of pneumonia at his home, 6 Oakmere Drive, Baldwin. He was in his sixty-sixth year. Mr. Hoelzer had been in business for about 50 years. Surviving him are his widow, Anna Hoelzer; four sons, Valentine, Charles, Andrew and Peter; four daughters, Anna Reheiser, Helen Markey, Louise Kunkel and Lillian Koch; a sister, Malvina Wilhelm and 16 grandchildren. The funeral will be held at 9:30 a.m. Friday from the home, thence to St. Christopher's R.C. Church, where a solemn high requiem mass will be offered. Interment will be in Holy Rood Cemetery, Westbury." In 1942 Charles Hoelzer's sons, Andrew P. Hoelzer, and Peter A. Hoelzer (1912-1988), declared their intention to the continue their partnership under the name Charles Hoelzer & Sons (Brooklyn Daily Eagle, 25 March 1942, p. 12). This Charles Hoelzer sidewalk knob found on Bowne St. near Franklin Ave., Queens, differs in that the Hoelzer address is now Maspeth, Long Island. This Hoelzer & Son sidewalk knob has the telephone number 718 456-4400 which means the business was still going in 1984 when the 718 area code was introduced. 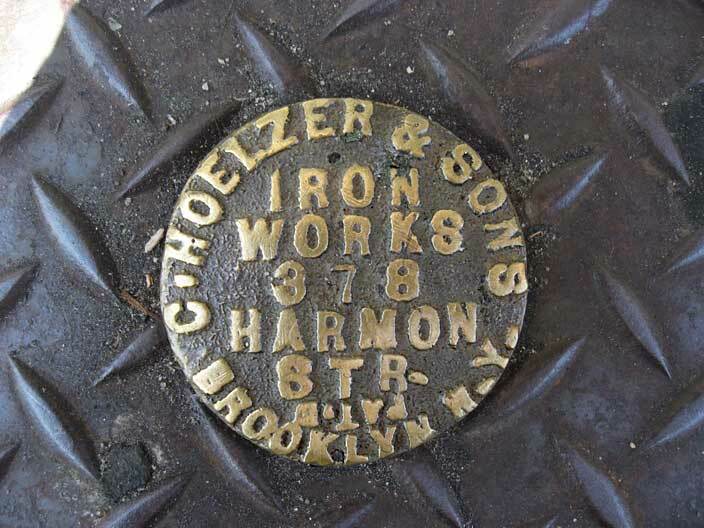 Several listing for Charles Hoelzer Iron Works in Maspeth, NY, are found on the current (2015) internet. This one from Superpages.com gives the address as 68-10 58th Ave., Maspeth, NY 11378, and the telephone number as 718 424-9436.